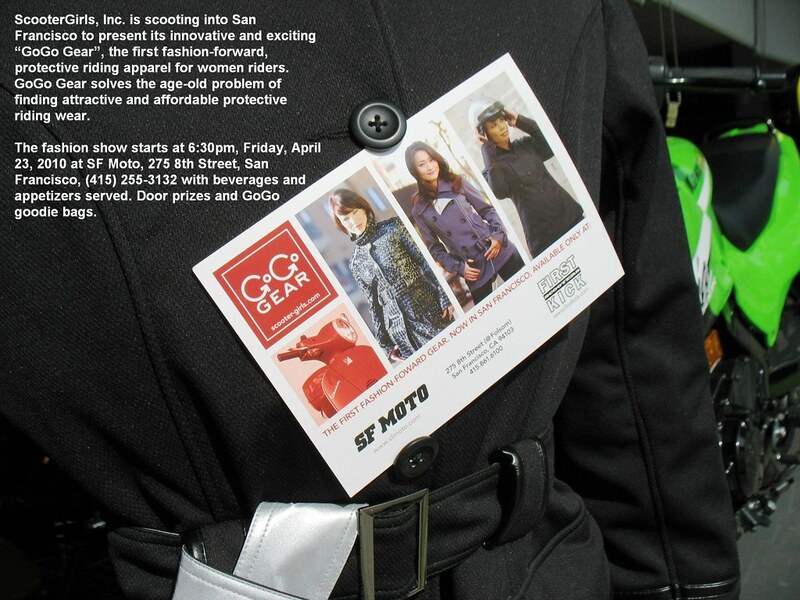 Last weekend was the SF Scooter Girls' Rally "So Far So Good IV". I had a great time riding along with a ton of scooter enthusiasts with a variety of scooters. Everything from vintage Lambrettas to modern Vespas and an Aprilia Scarabeo 200. I didn't know what to expect from it, but I was pleasantly surprised at what I ended up getting out of it. My first one was back in 2003, a Lemon Acid Aprilia Scarabeo 50cc, 2stroke. I learned a lot on that and it catapulted me into the dark, seedy world of motorcycles. Someone asked me at the rally why I love scooters so much. I don't know why, maybe it's because I owe my motorcycling life to that 50cc scooter. I had no idea I could love a sport this much, and if my husband and I never rented one in Vegas on our honeymoon, I never would've found out. I also think they're are a different animal compared to a motorcycle. Yes, they may not be as fast as a motorcycle and they may not corner like one, but they're a lot of fun in their own right. They can also be a huge stepping stone for someone wants to get into motorcycling. Or maybe not. Some people love scootering and that's it. Believe it or not, riding one can be more challenging than you think. Even though there isn't a manually operated clutch, there's still the matter of throttle and braking control. Since that's all you have, it forces you become more skilled at modulating your throttle and braking so that you can start and stop smoothly and remain stable at slower speeds. Ever wonder why you see people hang both their feet off the sides of a motorcycle or scooter? It's because it's really difficult to creep along at 5mph when your center of gravity is too high. But if you know how to balance your throttle and braking properly, you can make it look and feel effortless. That's definitely one of the challenging parts of scootering that makes it fun for someone like me. Living in San Francisco, you'll see a ton of scooters around town. That's because they're so economical and sensible in a densely populated city, with very very difficult parking options. It's just not convenient to drive your SUV to the Marina district and expect to find easy, almost free parking. But on a scooter? Absolutely. Motorcycle/scooter parking spots are everywhere (compared to other large cities, like New York) and you can always find a couple metered spots to park in. It’s been awhile since I had a scooter to ride regularly, so I forgot how easy and carefree it can be. Last weekend's ride was a fabulous event with a nice pace through the streets of San Francisco all the way down to the hills of Brisbane. Don and Crystal, owners of Scuderia West in San Francisco were gracious enough to lend me this zebra striped Scarabeo to test ride for the rally. I had no idea what to expect, since I’ve never ridden anything larger than a Kymco Agility 125cc. I also was afraid that a larger scooter would handle like an SUV or something large and awkward. I’m happy to report that I was wonderfully impressed with the Scarabeo. It was speedy, stable and most of all, fun! The zebra stripes certainly helped attract attention, as no one had seen this model before. If you're looking to upgrade from a 50 or 125, the Scarabeo might be exactly what you're looking for. Or maybe you have a BMW 1100GS sitting in the garage but wish it were a little smaller and and lighter for maneuvering rush hour. Who needs 1100cc to go buy groceries anyway? Wouldn't 200cc in the form of a compact, light and funloving scooter be better? If you haven't considered one before, I urge you to consider this one. And if you're a larger fellow, say 5'11", 195lbs, I would recommend at least 150cc-200cc to make sure you have a comfortable, enjoyable ride up those hills. I think a new rider of my stature (5’3”, 135lbs) might have a hard time maneuvering and handling the scooter without dropping it a couple times in the first few weeks, so I wouldn't recommend this scooter for someone without previous motorcycle or scooter experience, and with an inseam of less than 30". Even though the seat height is only 31.88", the wider seat makes it a little more difficult to put both feet down flat. So you may need a couple more inches of inseam in order to be flat footed. Not that it's impossible, but certainly makes for a challenging learning curve. Just make sure you wear a solid pair of motorcycle boots with plenty of traction to help you manage the weight. If you're looking for a scooter to handle passengers, or your significant other won't go anywhere near the back of your motorcycle, the Scarabeo should provide plenty of space and comfort for him/her to go with you for a night out. If you've never been a passenger then you just don't understand how it can feel on the back of a motorcycle with absolutely no control over what might happen and how scary sudden acceleration can feel. When I left Scuderia, Abby in Sales told me she thought it was the best one that felt most like a motorcycle. She was right! One thing that I didn't like about the Kymco Agility 125 is that it always felt a little wobbly up front when starting and stopping. The throttle response on the Scarabeo always felt quick and solid. I never felt like there was a lack of power, given the speed of traffic I was riding in. It seems like the they've provided just enough torque to get off the line and keep up. According to Aprilia, "The front and rear wheels are linked by a new integral braking system that distributes braking force between the two wheels and guarantees ultra-short stopping distances in complete safety.” No wonder why it felt stable and smooth when coming to a stop. There's definitely a considerable difference in the suspension, braking and handling. This made for a really fun ride, especially through a rather twisty, tight section of San Bruno Avenue. If you've ever ridden through the hills of Berkeley, near Grizzly Peak, with its narrow roads and hairpin turns you know how challenging that can be. San Bruno Avenue gave us just that. The Scarabeo was nimble, easy to maneuver in the corners and really fun. At one point our ride took us on Guadalupe Canyon Parkway, a mini highway, where I approached speeds of 45-55mph with ease. I felt like I could easily go faster if I wanted to. It felt sturdy and solid pushing 50mph and I never felt uneasy as if I were going to topple over. With a dry weight of a little over 300lbs, this scooter isn't going anywhere at those speeds. Going from 650cc to 200cc seems painful, right? Not when you're riding in San Francisco. It's so convenient to hop on a scooter to the grocery store, toss your groceries under the seat or in your top box. The only downside to this zebra striped scooter is the lack of underseat storage space. Sadly it'll only accommodate a half helmet, a purse or maybe a small pair of flats. You'll have to get a Givi top box in order to have more space to keep a full face helmet and small bag of groceries. Aside from the 'glove box' below the instrument panel, you'll also find a hook below the seat to secure one small grocery bag, in case you don't have a top box. Last week's ride lasted a few hours with the various breaks we took in between the different stops. By the 2nd hour, my behind was feeling a little flatter than usual and was jealous of the Vespa LX150 with the custom Corbin seat. With that upgrade, I think the Scarabeo would be fun on an overnight ride down Highway 1. Overall, I really enjoyed riding the Scarabeo and would consider buying one in a heartbeat. Sadly my garage currently only accommodates 2 sportbikes, but should another space open up....I would love to add this to my stable. If you're considering a Vespa 150 or 300 or any other scooters in the 150cc-300cc range, you have to add the Aprilia Scarabeo 200 to your list of options, given the performance, value and comfort. Last night I was fortunate enough to spend some time with the SFScooterGirls (“SFSG”). If you’ve ever ridden or driven around in the City, then you’ve probably seen a lot of women on scooters. It’s a great way to get around and of course, it’s fun! But who are these women? Where do they ride? Where do they come from? Well, that’s what I went to find out when I was invited to join their biweekly meeting, which happens every other Tuesday. The meetings are usually either held at The Buck Tavern or Winston's in the King George. The location is posted each week on the Yahoo Group, Facebook and MySpace. About a dozen members of the organization attended. Although the SFSG have over 1,000 combined friends and fans on Facebook, MySpace and a newly established Meetup group, there are less than 20 actual members, who are responsible for keeping the SFSG organized and running. Aside from biweekly meetings, these girls RIDE. And not just around the streets of San Francisco. East Bay, South Bay, North Bay, anywhere they feel like going. Since they were founded in 2004, the SFSG has organized dozens of rides and rallies, including their Annual Holiday Toy Run and an annual rally called So Far So Good, as well as events with other local/national clubs. The next big Rally that the SFSG is planning for is taking place the entire weekend of Sept. 10-12, appropriately called "I Left My Heart in San Francisco." Not only will they be leading multiple rides in San Francisco and in the East Bay, but there'll be breakfast, bowling and more! The SFSG, like any other motorcycle or scooter club, has minimum requirements in order to become a full fledged member. “Any Girl, Any Scooter” is welcome to apply for membership. If you enjoy riding your scooter and want to ride more than just to and from work/school, then the SFScooterGirls are for you. If you’re interested in joining and would like to find out more about these lovely ladies as well as how to become a member, visit their website at SFScooterGirls.com. Be sure to join the Yahoo!Group so you can find out about the most current events and gatherings. You can also find them on Facebook and Meetup.com.